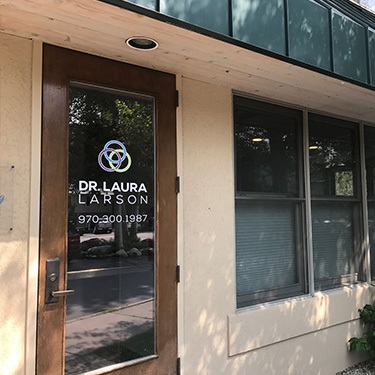 Since 1993, Dr. Laura Larson has always made optimal health and well-being the primary focus of her chiropractic care center. We’re passionate about providing high-quality, natural methods of pain intervention and health revitalization to the Avon, Vail Valley, Edwards communities. Our goal is to help family members of every age through customized, compassionate and results-oriented treatment. We believe that there’s no such thing as “one size fits all” when it comes to appropriate treatment. Bodies differ from each other in many aspects: age, physical condition, dietary habits, genetic considerations and hormonal imbalances. We offer our patients a full spectrum of alternative approaches that, when combined skillfully, bring about transformative change in those we serve. We want our patients to “light up” from the inside out, living their best life. Our office is unique in our dual approach of state-of-the-art chiropractic care combined with a functional nutrition approach. With rapidly expanding technology at our fingertips, our treatment toolbox remains an ever-increasing source of hope, healing and compassion for the many people we serve. We find that many people flock to our office in need of assistance in refreshing and rejuvenating their body systems. They feel stuck, heavy, hopeless, dismissed and skeptical. Extreme fatigue, digestive issues, hormonal imbalances and chronic pain rule their lives. Don’t wait to start feeling better! We know we can help. Contact us today for a free consultation at our caring office.